Carnival season starts roughly 9 weeks before Easter so each year the dates are different. Generally it starts early February in Las Palmas (for 3 weeks) followed by another 9 days in Maspalomas then another 2 weeks of smaller events in other towns around the island. 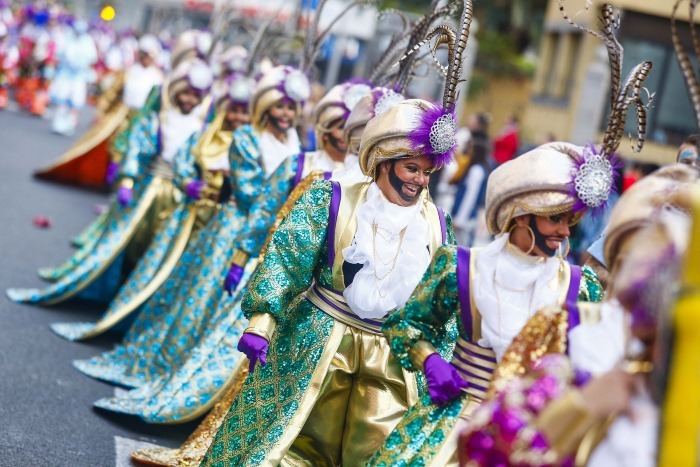 Hundreds of thousands of people attend the main events in both Las Palmas and Maspalomas and on the day of the big parade the streets are packed all afternoon long with tens of thousands attending the night time street parties until the early hours. Events to watch out for are the carnival queen competition, the drag queen competition and the big parade. There's a day for the kids in there somewhere and on the night of the big parade almost everyone goes to the street party in full costume. The shows take place in Parque Santa Catalina in Las Palmas and the Yumbo center in Playa del Ingles/Maspalomas.